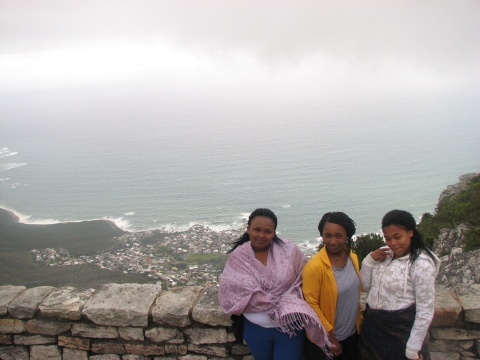 This past Sunday the Masinites hit Table Mountain. 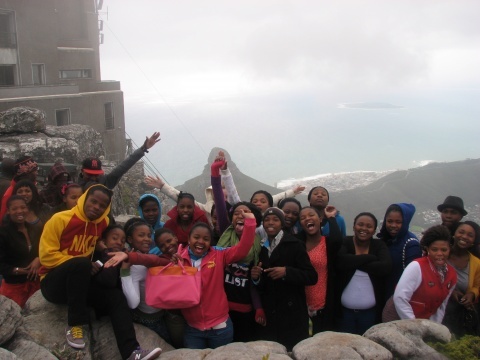 Despite the outing being cancelled twice during winter school because of unpredictable Cape Town weather, the learners finally made it to the top of our local natural wonder of the world! 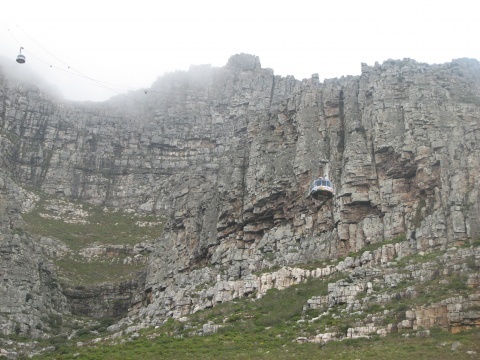 Thirty-five learners and several volunteers ascended in the cable car and braved the icy temperatures to explore the top of the mountain. Visibility was not ideal, but the fog did clear enough to take in the stunning views of Cape Town. It was great to have an outing together and reward everyone for their hard work and dedication to IkamvaYouth! 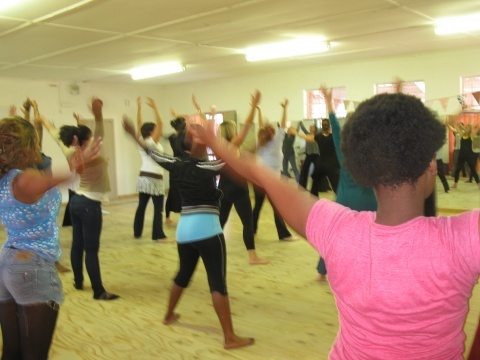 Today the Ladies’ Club from the Masi branch shook, shimmied and sweat in a nia class. 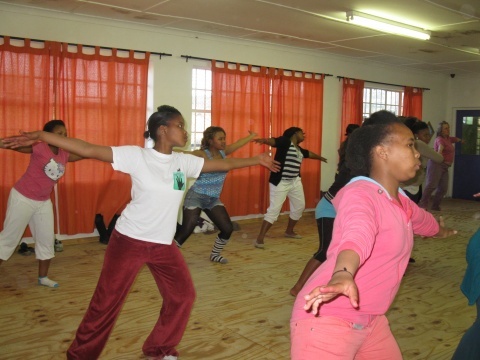 The girls went to Ocean View High School to attend a class put on by Maggie Joubert. 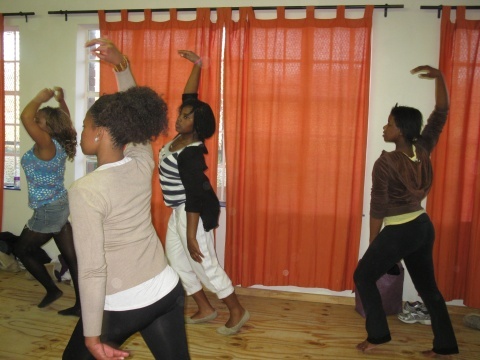 Nia is a form of cardiovascular aerobic exercise that is done to the beat of music and puts you more in touch with your body. The girls danced, had fun, and got a workout in the process! They loved it so much that plans have been put in the works to make nia a monthly occurrence for the club. Thanks to Maggie for hosting us and we are all looking forward to coming back soon! The event, which took place on the 18th of August, was an attempt at creating a platform for the youth as individuals, and representing organisations, to discuss issues and challenges facing South Africa, and contribute in generating solutions. The event was hosted by the Organisation of African Youth, in partnership with the Wits Disability Unit and The Consulting Academy. The Symposium, the first of many that shall foster platform for the youth to begin setting the agenda and enabling environment to discuss issues affecting the country as a whole, and not remain pedestrian by-standers in issues of national interest. According to the official guest speaker, Patson Malisa,”We (the youth) are the most important component towards the change and revival of the African Continent,”. As the crowd discussions commenced, the audience still referred to “they” and “I” rather than forming a collective group of responsible youth. Patson highlighted the importance of values such as selflessness and the power of united voice as the youth. A freelance journalist for Mail & Guardian attended the event and was in search for answers. I took a leap to market IkamvaYouth and told him the importance of the event, and that IkamvaYouth as an organisation consisted of youths that are motivated to resolve issues surrounding the education crisis in South Africa. I informed that the IkamvaYouth model has seen a by-the-youth, for-the-youth revolution in education for all beneficiaries and volunteers. 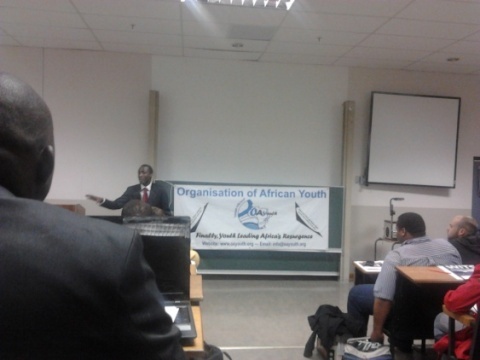 Representatives of other organisations such as Africa Tycoon and Pretoria Boy’s High provided their perspectives. The lack of leadership was addressed and seen as due to a lack of responsibility and the issues of leaders of the majority being chosen by the minority. The second issue raised for discussion looked into the gap between the rich and poor. I personally gave insight, stating that the problem lies with a misconception of the meaning of wealth as “What others have that I do not have”. I then provided an alternative school of thought based on the concept of individuals needing to define their own meaning of wealth to attain their personal success. Similarly, one academia stated that the term ‘rich’ must be measured in terms of productivity as that is a true reflection of the attained resources. The Symposium was a great attempt to a solution driven platform by the youth. While there remains a long way to go in achieving a holistic dimension to contributing to making our country and Africa a better place for everyone, the small efforts of helping one learner at a time as we do at IkamvaYouth is a great step that must never be despised. As the youth, we have what it takes to address all the ills affecting our communities, if only we can be a united front to this end!! It is important to explore different cultures with others and there are so many ways to do so. On Tuesday the 14th of August, the Ebony Park homework session was a hub of activity as the volunteer Pakistani interns decided to celebrate Pakistani Independence Day with the learners. After the homework session, Akbar Raza, along with Rafay and Abdul Samad Zia, taught the learners the Pakistani National Anthem ‘Dil Dil Pakistani!!’. 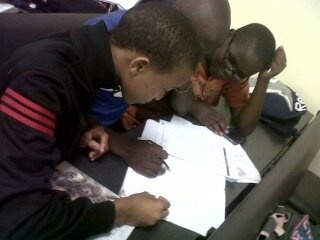 The learners and Interns had a real great time. The video of this exciting moment can be viewed here. Believe it or not, our young Ikamvanites are on the road to learning “Urdu” the official Pakistani language. IkamvaYouth branches in Chesterville and Umlazi need tutors, mentors, workshop facilitators, and administrative interns. This is a great opportunity to gain experience working with youth and community projects, build your skills, and help the youth of today. Find out how on our volunteer_invite.doc.